Two key former officials in the Cristina Fernández de Kirchner administration will face an oral and public trial over alleged fraudulent activity surrounding the broadcasting of national football matches. Former Cabinet chiefs Aníbal Fernández and Jorge Capitanich, and Argentine Football Association (AFA) leaders including former president Luis Segura, stand accused of defrauding the State through the mismanagement of state funding for the Futbol para todos (Football for All) programme, which is broadcast on Argentina's Public Television station. The trial comes after Federal Judge María Servini de Cubría concluded her investigation into the matter. The judge acquitted former Cabinet Chief Juan Manuel Abal Medina. Thirteen men in total will stand trial, including former Argentine Football Union boss Sergio Marchi and former AFA chief financier Rubén Raposo. The court will review evidence including bounced cheques and book keeping, which prosecutors say proves former government officials were involved in the mismanagement of state funds. 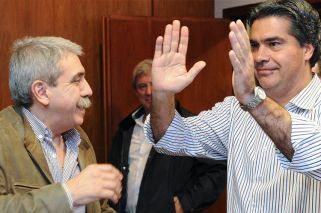 The trial is the latest in a series of court decisions against former Kirchner government officials. One of the most the scandalous, the so-called 'notebooks of corruption affair', is the sixth trial of its kind against former president Cristina Fernández.